I want to use this wifi modem for NAS, and have plugged in a USB thumb drive, FAT32. When I look at the home page under "My Media" I get an error. I also tried a Toshiba external hard drive, 2TB. It's NTFS. 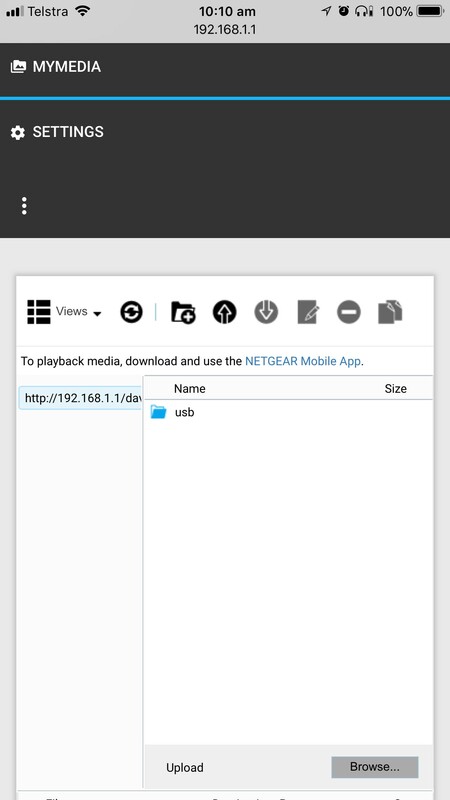 "To use MyMedia, please ensure a compatible micro SD drive or USB is inserted to your router. Only NTFS, HFS+, HFS, FAT32 and FAT16 formatted media is supported." Problem is resolved. After a tip on another forum, I formatted my USB thumb drive (Windows 10) and then plugged it in again. I could then browse the drive. I then plugged in the 2TB drive which had previously displayed the message, and it also worked (but I didn't format it...) Not sure why that fixed the problem, but it did. Hopefully this helps someone else if they get the message (above). I'm not 100% following your difficulty. How are you connecting to your Netgear Nighthawk M! modem (With Wi-Fi or Ehternet)? Which device(s) are you using to connect (Laptop, smartphone, tablet, etc)? Some devices do struggle with drive sizes that are 2TB, what was the size of the thumb drive you used to test this? Which firmware version are you using with your Netgear Nighthawk Modem? I've not been able to replicate the issue you have. Please see the below screenshot of our test Nighthawk modem with successful access to a USB Device connected. This test was conducted with an iPhone connected via Wi-Fi. USB Thumb Drive is formatted to FAT32 and has 8GB of storage.